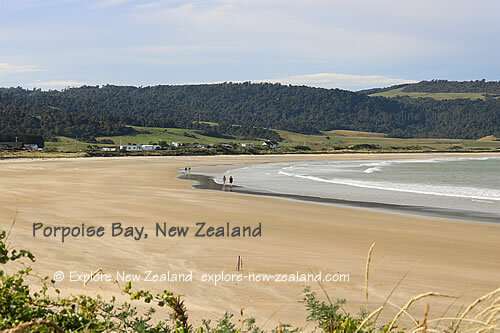 Porpoise Bay is in the Catlins, south east of Southland region, South Island. The Bay is home to some of New Zealand’s families of Hector’s Dolphins, Yellow Eyed Penguins, and New Zealand Fur Seals and Sea Lions. The entrance to Porpoise Bay from the sea is a wild and ancient headland. 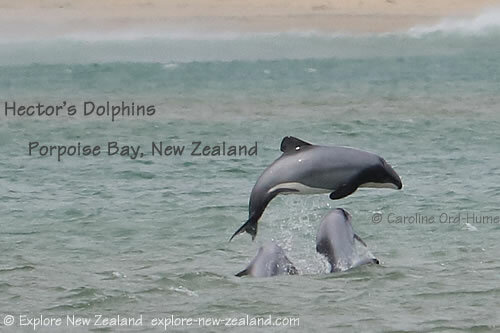 Living in Porpoise Bay there are pods of rare New Zealand Hector’s Dolphin/papakanua (cephalorhyncus hectori). Hector’s Dolphins are not only rare but are also the smallest dolphin in the world, and completely unique to New Zealand waters. 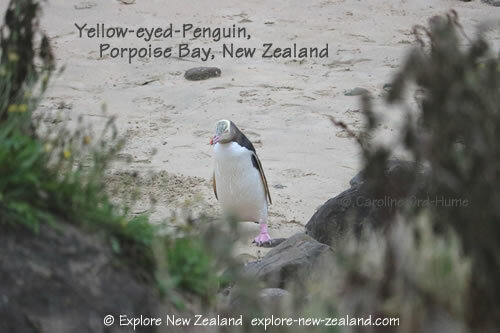 There are a few rare Yellow-eyed Penguins/hoiho that nest on the Porpoise Bay side of the headland and can be seen making their way up the hill to their nests in late afternoon. New Zealand Fur Seals and New Zealand Sea Lions are often seen in the Bay, usually lazing around on the rocks at the end of the beach but be aware that they may also be encountered in the sea. 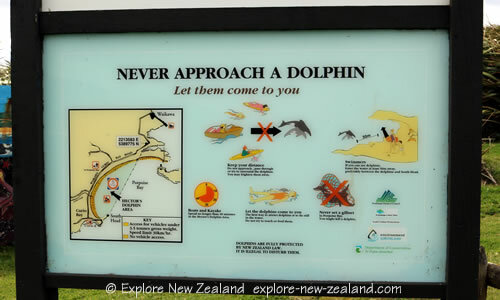 There are information boards at Porpoise Bay that tell you all about the wildlife and how you can avoid disturbing or harassing any of the native birds and animals by keeping a certain distance away and not blocking their route to nesting sites etc. 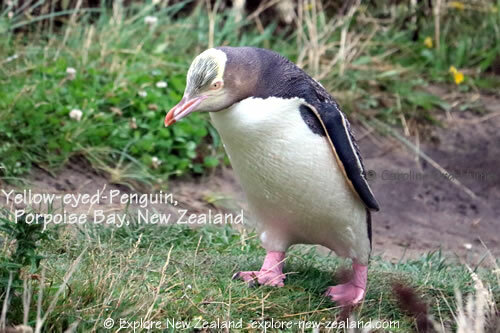 This applies to all wildlife in New Zealand but I am giving a brief overview of three rare animals you are likely to encounter in the Bay. 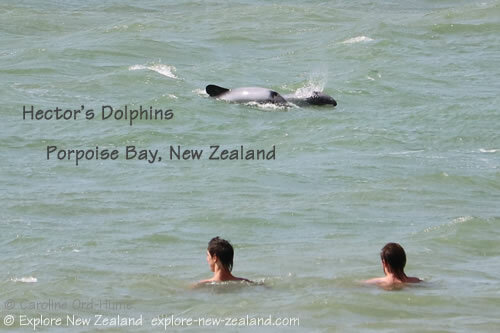 Specific to swimming or surfing in Porpoise Bay is the guidance advising you how to enter the sea when there are Hector’s Dolphins nearby, and what not to do to ensure the safety of the dolphins and yourselves. Enter the sea 50 metres away from the dolphins. If the dolphins approach you, do not touch them as their skin is very sensitive and/or you may frighten them. Please read the information board before going into the sea. Visitor guidance includes a request not to block the path of penguins when they come out of the sea in the afternoon and try to make their way to their nests in the hillside or cliff. I have to have a bit of a moan about tourists here. Despite lots of advice given on information boards, I witnessed about 15 people blocking one little Yellow-eyed penguin/hoiho from getting to its nest at the end of the day by literally sitting in its path in order to take photos. If that penguin had been frightened back into the sea it may not have survived and/or it’s young waiting for food at the nest may equally not have survived. It is absolutely vital that these penguins can get to their nests in the afternoon at the right time. Any delay caused by blocking the penguins reaching their nests poses a risk to their wellbeing. It is completely unnecessary for humans to block their path to take photos that can be taken as successfully off to one side so the penguin can go to its nest without obstruction. Note: The photos of penguins on this page were taken from a long way away with a zoom lens and the images were then cropped to make it appear the penguin is closer than it actually is. It is important to understand that fur seals and sea lions can be aggressive, particularly if you are blocking their way to the sea or come between them and their mate, opposition, or young. Sea lion in particular can be very large and have a lot of weight, and although they look slow they can actually move very fast. Tourists and visitors do sometimes get bitten by sea lion, not just in New Zealand by the way. 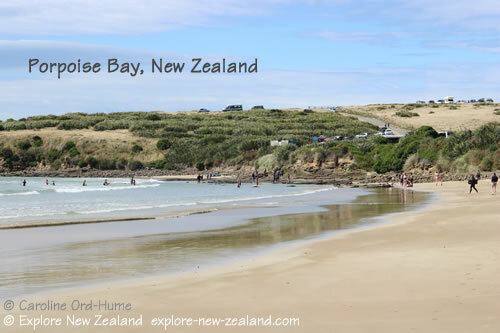 Porpoise Bay is popular for both swimming and surfing as it is a sheltered bay and considered to be relatively safe for these sports. Inquisitive dolphins will often come towards swimmers and surfers and sometimes swim quite close. It is a big attraction at the Bay where people can go stand in the water, or sit on a surfboard, and wait to see if the dolphins come over. There is a campsite between the Porpose and Curio bays with easy walking access to both. A lot of the pitches are surrounded by New Zealand Flax plants to shelter campers from the winds coming off the sea. The campsite has a small shop selling essentials. The main route to Porpoise Bay is along SH92, also called the Southern Scenic Route. 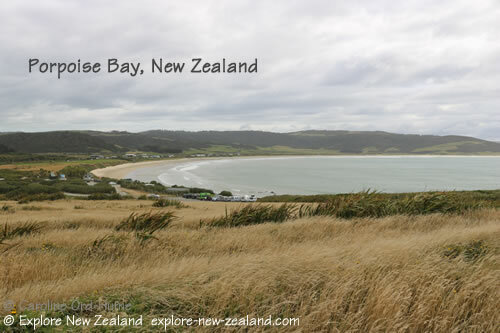 To get to the Bay from the Southern Scenic Route SH92, turn down Niagara Waikawa Road, turn right at Waikawa and drive around 7km down the Waikawa Curio Bay Road. At Curio Bay turn left to get to Porpoise Bay by going through/past the campsite and you will find a parking area, toilets, and a small campsite shop. As you pass through Waikawa consider stopping at the Waikawa Museum which is also host to a Visitor and Dolphin Information Centre. Southern Scenic Route SH92 runs from Balclutha to Invercargill in Southland New Zealand.